Filed to: the kids are alright?Filed to: the kids are alright? Demonstrators gather in Franklin Square in downtown Washington, Monday, Nov. 9, 2015, before marching to the White House. Expect more like them on July 21, 2018. Whether it’s increasing gun violence or rising inequality, leaders are failing future generations. That’s no more true than with climate change, basically the biggest intergenerational debt that’s ever been passed on. That debt has inspired a group of teenagers across the country to plan a march on Washington, D.C. on July 21 to kickstart a new, young climate movement under the banner of Zero Hour. The motivation is simple: they want a climate that, if not exactly like the one their parents have enjoyed, hasn’t been totally warped into a deathtrap of more deadly heat waves, powerful storms and ferocious seas. So is the argument: we need to start acting now to reduce carbon emissions to stave off the worst impacts of climate change. And the solutions are staring us in the face. Margolin is a plaintiff in a lawsuit suing the Washington state government for not doing enough about climate change (one of a handful of similar suits across the U.S.) and the founder of the Zero Hour, a new youth-driven movement for climate action starting with the July march. She said in her work advocating for climate solutions, policymakers and other adults she’s met with have told her they feel her plight but don’t feel compelled to act. Rather than take no for an answer, Margolin and her crew are forcing the issue. The idea began, like all things teen, on Instagram. Margolin put out a call in an Instagram story saying she wanted to organize a march for climate action and asked who was in. The two still haven’t met IRL but have been busy organizing online ahead of the march, and planning for what comes after. The organization is run by core group of eight youth, and has a few adult mentors to help as needed. Eleven organizations are also listed as partners, including local groups and national ones like the Power Shift Network. By taking to the streets in Washington, D.C., they want to send a message to politicians and the industries that line their reelection coffers that the next generation won’t stand for the status quo. Indeed, the failures are clear. The planet is hottest it’s ever been in recorded history, and our atmosphere is on track to a state unseen in 50 million years if we keep emitting carbon dioxide. Last year’s raging wildfires and powerful hurricanes showed that nobody is immune to the effects of climate change, and that marginalized communities inevitably suffer the most. The suffering of future generations will only be compounded by the carbon emissions of today. The Zero Hour manifesto calls out these injustices, and Margolin said the stories of underrepresented groups suffering, as well as their fight for their rights to clean air and water, is central to the movement. Margolin’s passion and organizing began well before the Parkland school shooting last month, but it’s hard not to see parallels between the two struggles. They both feature young people asking for their basic need to feel safe and secure met. And those young people are highly motivated to disrupt an entrenched system that stands in the way of meeting those needs. 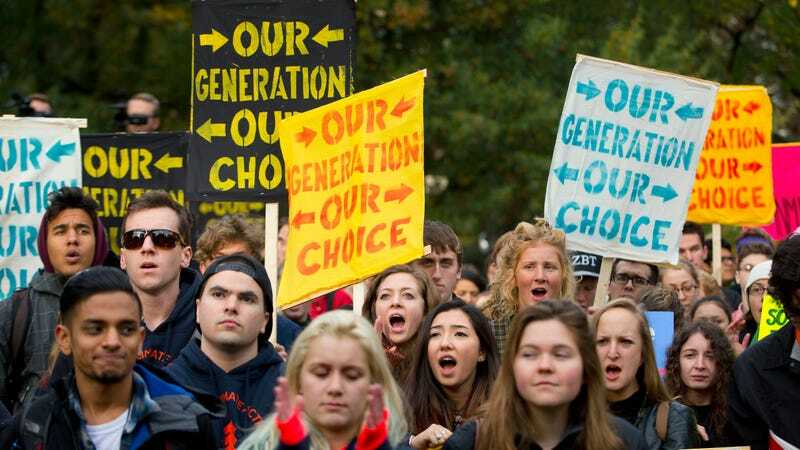 If Margolin and youth in the streets in Washington, D.C. this summer isn’t enough to get politicians to reconsider their recalcitrant positions on climate change, there’s one thing that might: many of those in the streets will be 18 come the 2020 elections. And if you think they’re angry and ready to change things now, just imagine what having two more years to stew and organize will do.